Not to be confused with Aspergillus. An aspergillum (less commonly, aspergilium or aspergil) is a liturgical implement used to sprinkle holy water. It comes in two common forms: a brush that is dipped in the water and shaken, and a silver ball on a stick. 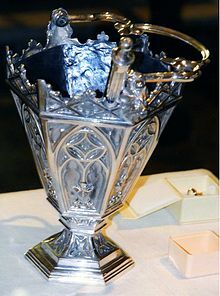 Some have sponges or internal reservoirs that dispense holy water when shaken, while others must periodically be dipped in an aspersorium (holy water bucket, known to art historians as a situla). An aspergillum is used in Roman Catholic and Anglican ceremonies, including the Rite of Baptism and during the Easter Season. In addition, a priest will use the aspergillum to bless the candles during candlemas services and the palms during Palm Sunday Mass. At a requiem, if a coffin is present, the priest will sprinkle holy water on the coffin. The aspergillum can be used in other manners where sprinkling of holy water is appropriate, as in a house blessing, in which the priest might bless the entry to the home. The name derives from the Latin verb aspergere 'to sprinkle'. The form of the aspergillum differs in the Eastern Orthodox Church. In the Greek Orthodox Church the aspergillum (randistirion) is in the form of a standing vessel with a tapering lid. The top of the lid has holes in it from which the agiasmos (holy water) is sprinkled. In the Russian Orthodox Church the aspergillum is in the form of a whisk made of cloth or hair. Sometimes, sprigs of basil are used to sprinkle holy water. In some of the Oriental Orthodox Churches, no aspergillum is used, but the priest will pour holy water into the palm of his right hand and throw it on the faithful. An aspergillum is also used in other religions, including Balinese Shaivism (Hinduism). Further, these ceremonies conducted by the priest did not cure skin disease. According to Luke, the diseased person came to the priest after he had been healed (Luke 5:14). The task of the priest was to make the person who had been excluded from the camp, from his people, and from God, ceremonially clean. Through these ceremonial cleansings, which took place in two stages, a week apart, the diseased individual was restored to fellowship with God and with His people. The procedure was a first stage of cleansing which took place outside the camp. The man washed himself and his clothes, and shaved. Two birds were taken. The blood of one was used to purify the man. 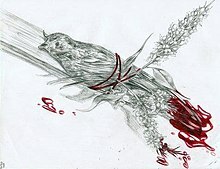 The death of that bird portrayed the end of the man’s old life outside the camp, and the flight to freedom of the other pictured his liberation from the effects of the disease. Then the man might enter the camp again." Aspergilla are also used in modern paganism, particularly to cleanse a ritual area in Wicca, as part of a spell, or during a Wheel of the Year festival in contemporary Witchcraft. Lunarized water, saltwater, or rainwater are most typically used. ^ Aspergillum, Merriam-Webster Dictionary. Retrieved on October 8, 2014. ^ Bennett, Joan W. (2010). "An Overview of the Genus Aspergillus". In Machida, Masayuki; Gomi, Katsuya (eds.). Aspergillus : molecular biology and genomics (PDF). Wymondham, Norfolk, UK: Caister Academic. ISBN 978-1-904455-53-0. Archived from the original (PDF) on 2016-06-17. Retrieved 2016-05-13. This page was last edited on 26 October 2018, at 04:27 (UTC).